You may be feeling it right now as you read this. Overwhelmed and exhausted, you are wondering if you have any more left in you. You feel lost, wondering if you are able to even access that place within you that contains the stamina you need to keep going. Let these stories and devotional thoughts take you through the valley and up to the mountaintop where you can experience the promise of how you can go the distance! Multiple Perspectives On One Subject. This devotional, written by 15 people, who have all experienced God's gracious teaching on how to endure through difficulty, is truly a multicultural look at the subject, for along with the fact that each author is a person of faith, there is a delightful mix of men and women, singles, married, divorced, those with disabilities, African Americans, caucasians, and Hispanics, young people, middle age and mature adults, Canadian, American, Australian, represented. Each author's story is uniquely their own. You will gain multiple perspectives on what it means to endure. What an inspirational book! 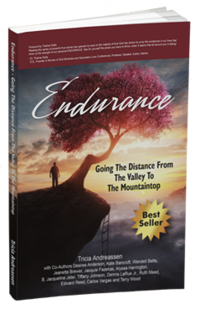 Authors come together to share their stories of endurance through struggles, pain, and hardships. Each story is different and so inspiring. A great read for any age. What inspiration from the authors. My heart was ignited by the personal stories ow how they faced adversity and how they walked through it. Whatever life is throwing at you, these stories will inspire you and give you the spark to keep moving forward. It's a must read! Facing Death With A Shark - WOW. This book has been such an encouragement to be involved in and read. From facing death from COPD to caring for a special needs child to fighting off a shark and losing an arm, these stories are sure to give you the endurance to go the distance and never give up. You have the strength within to endure and face your giants. This book is a well written colaboration of 12 authors who faced the challenges life gave them some life threatening and Endured to go the distance and get from the depth of the valley to the mountain top. Well written and a very good read. An excellent Personal Development and study guide !! An excellent personal development and study guide book. These 15 stories of seasons in the lives of authors who have endured, have reached the summit and now are teaching others how to climb out of the valley are heart and soul boosting ! The "Strategies for Building Your Endurance " at the end of each story are fantastic study guides to use in Leadership development training for our business teams in our weekly training classes.. The professional links at the end of each story are a plus to be able to continue to follow the life journeys of the authors continued climb up higher mountains !!!! We loved this book !!! Wow! If you need encouragement, a renewing in your faith, or just to be inspired...this is the right book! I love how it includes devotional questions to really make you stop and process what you read. It is so easy to read book after book and do nothing with what you learned. This one will make you want to take action in your life!